Urtak Raises $500k To Ask You The Big Questions: Yes? No? Don’t Care? Back in the old days of online publishing (say, 2007), you’d reach the bottom of a blog post or news article, peruse the comment section, possibly leave one of your own, and then move on to the next hot story. These days, things are a lot different. Many sites are now experimenting with myriad widgets: story recommendations, games, polls, a dozen sharing options — if you can think of it, someone has tried embedding it at the bottom of a post. One company that’s part of this trend is Urtak, a startup that participated in the most recent batch of TechStars NYC. And today it’s announcing that it’s raised a $500,000 seed funding round with investors including Vaizra Investments, Quotidian Ventures, Advancit Capital, and Esther Dyson. 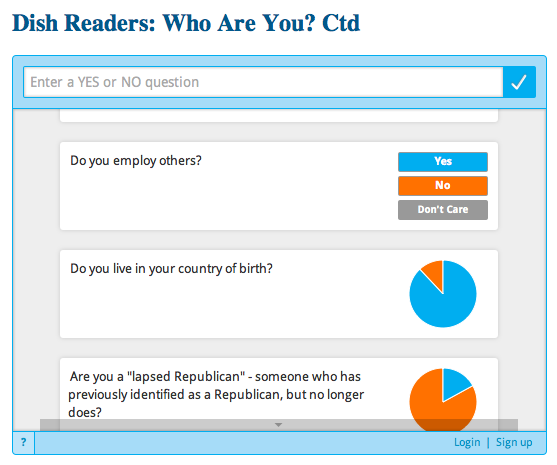 Urtak’s product consists of a Q&A widget, which allows publishers to pose questions to their readers, who can respond to each question by choosing one of three answers: “Yes”, “No”, or “Don’t Care”. For example, I might include a widget in this post that asks, “Are you a fan of the Oxford comma?”, to which you’d probably respond, “Don’t Care”. That’s it — you can’t actually leave a more extended answer to any of the questions, though you’re free to quickly answer a bunch of them if you’d like. Of course, there are already other products out there that focus on engaging readers, some of which offer polls. So what makes Urtak any different from, say, PollDaddy? Cofounder Marc Lizoain points out another feature that he says is unique to Urtak: readers can actually add their own questions, which will then be posed to other readers after the publisher approves them. Which means that if a publisher embeds an Urtak widget in one of their stories, they could wind up with hundreds or thousands of votes — and dozens or hundreds of questions asked as well. I’m not sure how defensible this difference is (I don’t think it would be very difficult for other polling services to integrate a similar ‘Ask a question’ feature), but it seems to be working so far, as the company has landed some notable publishers who are using the widget: Andrew Sullivan has started using Urtak in his Daily Beast columns (you can find one here and here), and it’s been used by The Huffington Post, CBC in Canada, The Blaze, and Colombian site El Tiempo. They’re also showing some encouraging stats: Lizoain says that around 10% of readers wind up engaging with the Urtak widget, and those who do wind up responding to an average of 23 questions per session (remember, it’s pretty low-friction to answer, as you’re voting with ‘Yes’, ‘No’ or ‘Don’t Care’ instead of typing in an answer). Thus far, the service has collected over 22 million responses overall. Lizoain says that the company isn’t making any money at this point, but that it is considering allowing publishers to include sponsored questions in their widgets (e.g. The NYT could run a question asking, “Are you a subscriber to the NYT?”). The company was first created back in 2008 with the mission of trying to organize the world’s ‘opinion information’ on just about any subject. That’s still their long-term goal, but for the time being, they’re focusing on this more straightforward widget. As for the volcano above — Urtak’s homepage notes that the word ‘urtak’ means statistical sample in Icelandic.